Unintentional injury is the leading cause of death among children aged 10–19 years and over 95% of injury deaths occur in low- and middle-income countries (LMICs). As patterns of injury in the pediatric population may differ from those in adults, risks specific to children in LMICs need to be identified for effective injury prevention and treatment. This study explores patterns of pediatric injury epidemiology and cost in Yaoundé, Cameroon to inform injury prevention and resource allocation. 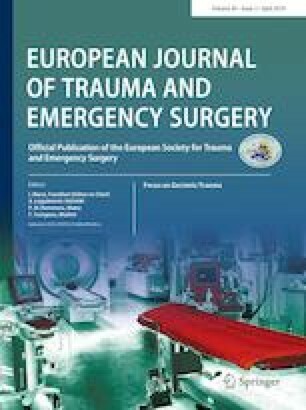 Pediatric (age < 20 years) trauma patient data were collected at the emergency department (ED) of Central Hospital of Yaoundé (CHY) from April through October 2009. Univariate, bivariate, and multivariate analyses were used to explore injury patterns and relationships between variables. Regression analyses were conducted to identify predictors of receiving surgical care. Children comprised 19% (544) of trauma cases. About 54% suffered road traffic injuries (RTIs), which mostly affected the limbs and pelvis (37.3%). Half the RTI victims were pedestrians. Transportation to CHY was primarily by taxi or bus (69.4%) and a preponderance (71.1%) of the severely and profoundly injured patients used this method of transport. Major or minor surgical intervention was necessary for 17.9% and 20.8% of patients, respectively. Patients with an estimated injury severity score ≥ 9 (33.2%) were more likely to need surgery (p < 0.01). The median ED cost of pediatric trauma care was USD12.71 [IQR 12.71, 23.30]. Injury is an important child health problem that requires adequate attention and funding. Policies, surgical capacity building, and health systems strengthening efforts are necessary to address the high burden of pediatric injuries in Cameroon. Pediatric injury prevention efforts in Cameroon should target pedestrian RTIs, falls, and burns and consider school-based interventions. We would like to thank the Ministry of Public Health of Cameroon, the Central Hospital of Yaoundé, and all of the research assistants for their support and efforts, which made this project possible. ONN, MKN, JC, IF, GM, MEM, GAE, RAD, AAH, and CJ declare that they have no conflict of interest. All procedures performed in studies involving human participants were in accordance with the ethical standards of the institutional and/or national research committee and with the 1964 Helsinki declaration and its later amendments or comparable ethical standards. This article does not contain any studies with animals performed by any of the authors. Wikipedia. Central Hospital of Yaoundé. Wikipedia; 2017. https://en.wikipedia.org/wiki/Central_Hospital_of_Yaound%25C3%25A9. Accessed 15 Sept 2017. Weeks SR, Juillard CJ, Monono ME, Etoundi GA, Ngamby MK, Hyder AA, et al. Is the Kampala Trauma Score an effective predictor of mortality in low-resource settings? A comparison of multiple trauma severity scores. World J Surg 2014;38. https://doi.org/10.1007/s00268-014-2496-0. Holder Y, Peden M, Krug E, Lund J, Gururaj G, Kobusingye O. Injury surveillance guidelines. WHO 2001:1–91. https://doi.org/10.1007/s13398-014-0173-7.2. Wikipedia. Age of majority 2018. https://en.wikipedia.org/wiki/Age_of_majority. Accessed 1 May 2018. The World Bank. Official exchange rate (LCU per US$, period average). Cameroon. 2009. https://data.worldbank.org/indicator/PA.NUS.FCRF?locations=CM. Accessed 1 May 2018.